OGA Conference and Vendor Exhibition – We Know the Industry. We Know Support. The Future is Yours! 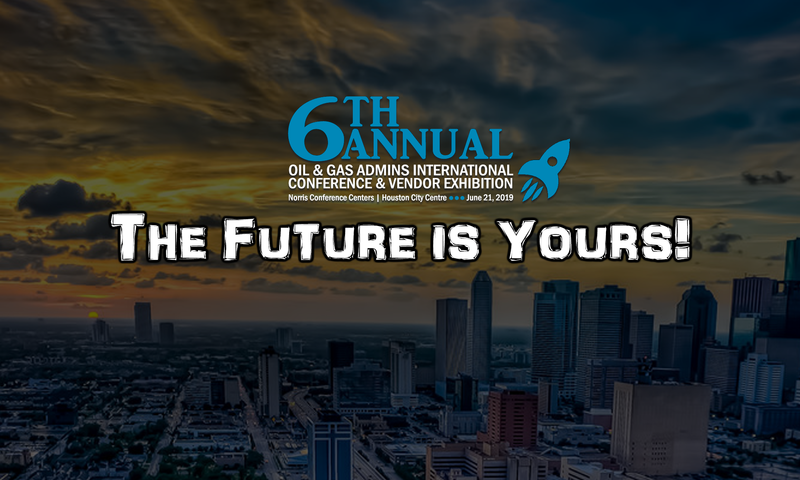 The 6th Annual Oil & Gas Admins International Conference and Vendor Exhibition will focus on tips, tricks, tools and resources to help you successfully navigate the future of the professional administrative role in the oil and gas industry. Our conference is the first to focus specifically on career and personal growth and development for oil and gas administrative professionals. It features dynamic and relevant speakers who share their wisdom and expertise on a range of topics all with the goal of helping you succeed. Attendees will have the chance to view, sample and learn about products and services from a wide variety of vendors that service the needs of the oil and gas administrative professional, and/or the oil and gas industry. Attendees had the opportunity to experience over 75 exhibitors at the 5th Annual conference! The conference is the first to focus specifically on career and personal growth and development for oil and gas administrative professionals. It features dynamic and relevant speakers who share their wisdom and expertise on a range of topics. Our past speakers have included diverse and dynamic oil and gas industry leaders and career and personal development experts. Our goal for the conference and for Oil & Gas Admins International is always to ensure that the administrative professionals have a thorough knowledge of not only administrative and soft skills but also thorough and certifiable knowledge of the oil and gas industry. The Oil & Gas Admins International Conference and Vendor Exhibition is the only conference dedicated to career development, networking and the unique requirements of the oil and gas administrative professional in a challenging and demanding industry. Our focus remains on information, tips, and tools to help administrative professionals excel in the oil and gas industry both personally and professionally. In this annual conference, O&GA CVE is significantly less expensive than other events. It ranks #1 as the only event to focus on the oil and gas administrative professional. Sell the importance of your attendance to the event by using the “Justify Your Attendance” letter. The letter will help you explain why you should attend and the benefits you will bring back to your company. Click the icon above.